Premier Auto Trade has launched a new range of Exhaust Gas Temperature Sensors into the Australian aftermarket. Exhaust Gas Temperature Sensors are essential in modern vehicles because they protect components that are located in the flow of hot exhaust gas from critical overheating. These sensors measure temperatures up to 900 degrees Celsius in the exhaust system of the vehicle. The sensing element of an Exhaust Gas Temperature Sensor changes in resistance with changes in temperature allowing the engine computer to measure the resistance and calculate the temperature. Depending on the location of the Exhaust Gas Temperature Sensor, the engine computer uses the temperature information to control a wide variety of processes in the vehicle. These processes include particulate filter regeneration, selective catalytic reduction, exhaust gas recirculation, turbo boost and overall engine combustion. Premier Auto Trade ensure that it’s range of Exhaust Gas Temperature Sensors utilise an OE construction consisting of high temperature metals and ceramics. This allows these sensors to deliver a stable and accurate output despite the heat, vibration and contamination found in the exhaust. Most Exhaust Gas Temperature Sensors are used to monitor the particulate filter. In these cases the failure to replace a defective sensor will result in an obstructed filter and possible engine damage. Always replace a defective sensor with a quality sensor. 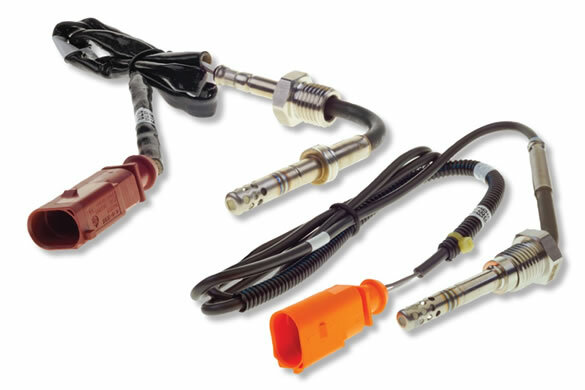 Also look out for Premier Auto Trades recently introduced selection of Exhaust Pressure sensors. Exhaust pressure sensors monitor the exhaust gas pressure either side of the particulate filter in modern diesel vehicles and allows the emission control system to perform according to emission standards.